Lawas ni Iyay: Secret Ingredient of Iloilo's Delectable Soup, Revealed - Choose Philippines. Find. Discover. Share. We know of batuan, calamansi, kamias, tamarind and vinegar as souring agents for our soups and other recipes, but did you know that there’s another Filipino ingredient that can make your favorite soup flavorful and delicious? Have you heard of the alabihod leaf? Alabihod is commonly known as libas and is also locally called as abihid, alambihod and lanu in other parts of the Philippines. Its fruit and leaves are edible and sour. Scientific name Spondias pinnata (L.f.) Kurz, it serves as herbal medicine for illnesses such as diarrhea and dysentery among others. But, this time let’s focus on the plant as an important ingredient in cooking. Let’s learn a soup dish recipe from our friend in Brgy. Damires, Janiuay, Iloilo called “Lawas ni Iyay." 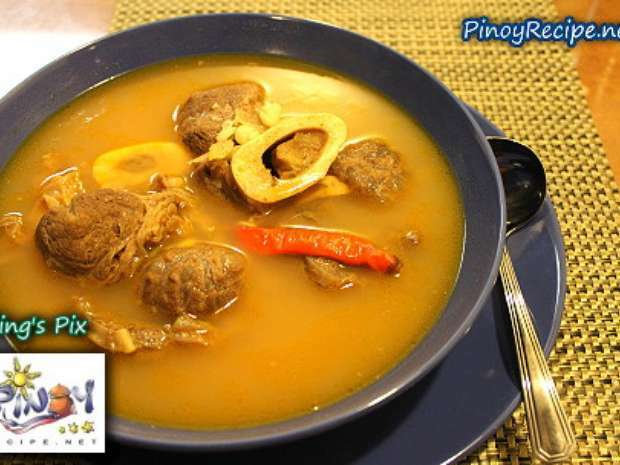 The classic recipe refers to a beef shank with lots of meat and bone marrow that makes the soup delicious. Prepare a pot for boiling water. While the water is boiling, put in the lawas and add some salt. Cover and let it boil until the salt is absorbed by the meat. Put in the tomatoes and wait for a few minutes before adding in the onions and beef cubes. This will enhance the flavor of the meat. Add the alabihod leaves. Simmer for a few minutes. Add the chili and season with black pepper and just before you turn off the heat, add the spring onions. Savor the soup with a different kind of sourness given by the alabihod leaves that closely taste like a mixture of tamarind and lemon. Let’s keep on cooking our old recipes and share it to the next generations as this dish is already part of our culture. From Manila, you can fly to Iloilo (estimated cost of Php3,000++, round trip, one hour). The Iloilo Airport is 30 minutes (approximately 19 km) away from Iloilo City. From Iloilo, you can take a jeepney bound to Janiuay (about 45 min to 1 hour drive) at Central Iloilo Passenger Terminal. The terminal is located at Ungka, Jaro, Iloilo City. Belle Piccio is the Visayas Editor of Choose Philippines. She goes the distance, literally and figuratively, be it when she's running or when she's pursuing a goal. She loves the S’s: Sun, Sand, Sea, Salad, Shake, Salsa, and Serenity!